Flying on fairy wings, befriending a dragon, and being the captain of a pirate ship are just some of the adventures one little girl and her puppy discover as they climb into the pages of a fairy tale. Is the best part of their story swimming with mermaids? Enjoying a cup of tea with Snow White? Flying a hot air balloon? Or is it something even more magical? 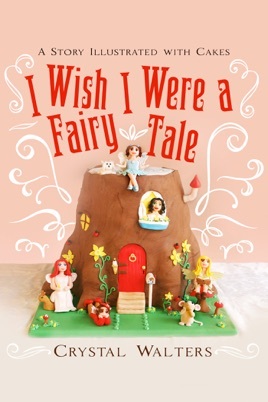 Each enchanting moment of this delightful tale is told on top of a cake. With every character, creature, and castle sculpted out of sugar and frosting, this is truly the sweetest fairy tale ever created! A Sweet Tale for Both Kids and Adults! This is one of the most creative books I’ve ever seen! Author and illustrator Crystal Walters takes us into a sweet story of dragons, mermaids, pirates and adventure, but perhaps the most fascinating part of the story is how she illustrated it—with photographs of her cakes! Obviously very talented, Walters created nearly 80 handmade sugar sculptures, as she calls them (I call them cakes!) to photograph for her narrative. These aren’t just sugar flowers made from decorative icing like you see on grocery store birthday cakes— they are characters that come alive with facial expressions, tiny books and toys, and dressed with such detail that the animal slippers on their feet have expression. I have never seen anything like it. I wish I were a fairytale with magic every day. I’d fly around on fairy wings, and all I’d do is play. Walters taps into our heart’s desires with this opening and sets up an enjoyable adventure through the pages. Combining rhyme with a fun story, we get to watch her main character live out our dreams and adventures on top of cakes. This is a colorful book worth revisiting again and again, just to take in all of the work that went into these cakes. It’s a creative marvel and sure to catch the imagination of children, as well as raise the bar on the next cake we moms try to make! This book has just the right amount of sweetness and adventure to encourage children to curl up under the covers with their parents for story time. Not only it is a feast for the eyes, but the little girl’s adventures set the stage for dream land. This book is…well, it’s the frosting on the cake! Highly recommended. It would make a great gift book—especially for a child’s birthday!